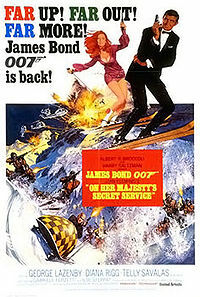 On Her Majesty’s Secret Service (1969) is the sixth spy film in the James Bond series, based on the 1963 novel of the same name by Ian Fleming, and the only one to star George Lazenby as the fictional MI6 agent James Bond. In the film, Bond faces Blofeld, who is planning on unleashing a plague through a group of brainwashed “angels of death” (which included early appearances by Joanna Lumley and Catherina von Schell) unless his demands are met. Along the way, Bond meets, falls in love with, and eventually marries Contessa Teresa di Vicenzo. This Bond film is the second in what is considered the “Blofeld Trilogy”, coming between You Only Live Twice and Diamonds Are Forever. This trilogy is of interest not only for the three different Blofeld actors (Donald Pleasence in You Only Live Twice, Telly Savalas in On Her Majesty’s Secret Service, and Charles Gray in Diamonds Are Forever) but for its two Bond actors (Sean Connery, then George Lazenby, and back to Connery). This is the only Bond film to be directed by Peter R. Hunt, who before was a film editor or second unit director on every previous film. Though its theatrical release was not as lucrative as its predecessor You Only Live Twice and Lazenby’s performance was much criticized, On Her Majesty’s Secret Service grossed over $87 million worldwide and was met with positive critical reviews.